After working on leopard population dynamics in South Africa’s Soutpansberg mountains in 2007/2008 Dominik followed up with a MSc at University of Hohenheim studying temporal and spatial variations in lion densities in Botswana’s Khutse Game Reserve and the southern parts of the Central Kalahari. He then joined the Makgadikgadi Fence and Lion Research project as a field assistant, which focused on the effectiveness of game fencing in solving human-wildlife conflict in central Botswana. 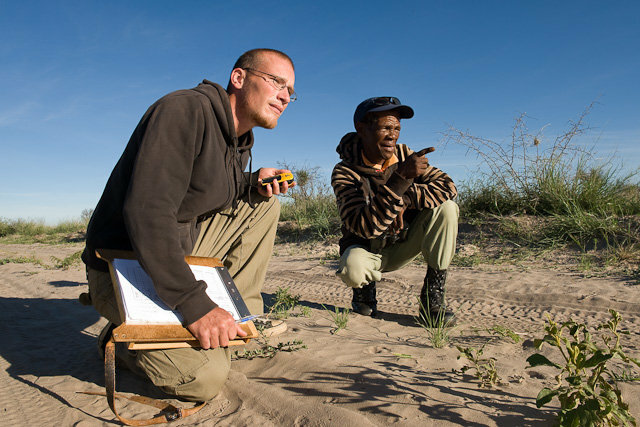 Dominik joined WildCRU in March 2013 and is now the Botswana Programme Manager for the Trans Kalahari Predator Programme, which focuses on habitat corridors for lions between regional protected areas within the Kavango-Zambezi Transfrontier Conservation Area. The project aims to motivate conservationists, communities and governments to take steps to protect these areas and thus the vital genetic connectivity between protected areas.